Well, it has been an interesting ride up until now. I was born and raised in a small city Cochin which is known as God’s own country! in the state of Kerala in INDIA. In my country , I guess parents want their kids to be doctors, scientists or engineers. Thats the norm and anything else is not considered so good. So like any other girl, I decided to pursue Science and completed my Masters in Microbiology. My parents were proud of me and I worked in India for 4 years in Academics. My Big Fat Indian Wedding. Then it was time for marriage. Ok people bear with me. In Indian culture, the parents choose or arrange for a boy to see the girl and DATING takes a new definition. In my case, my husband was in the US and working in NY city. His parents arranged for a visit to my city Cochin where they all flew. We met at a fancy restaurant. We were given some time to chat while they sat in the adjacent table eagerly waiting for our reply. They were thrilled to know when both of us said YES at the end of our meet. So yes, ours was an arranged marriage and as of today its 7 wonderful years with ups and downs and we have grown so much as a couple. We have 2 beautiful girls whom we love to death and have a beautiful family. Where and how did I find my passion for cooking? I gathered courage and made him a beet soup. Yes, I knew it was disgusting when I saw the tears roll down his cheeks and I thought to myself- OMG its bad!!! I had decided at that moment that I would learn to cook some delicious dishes for my husband. I felt so bad since he is such a food lover. I had never tasted Italian or Mexican or any cuisine other than Indian until my wedding with him. We rented an apartment close to NY city and he would take me every friday night to a new place to try a new cuisine and life was filled with fun and romance. I came back home and started trying every dish we ate. There was a point in my life where I woke up watching a food channel and went to sleep watching it . So food gradually started becoming our life and soul. I tried recipe after recipe and started getting better each day at cooking. My husband came back home after work every day and gladly enjoyed being the guinea pig to all my experimental dishes. He has been always very supportive and encouraging. I never had time or energy to cook a meal, the house was always messy, my kids and my husband extremely unhappy with the frozen meals that I offered them after a long day of work. Somewhere amongst all this was a bitter truth awaiting! All of us were extremely passionate about food and loved food like we loved each other. Why I quit my well paying full time position of Microbiologist? Being a Microbiologist was great but I realized that I had started missing something that was an integral part of our lives-FOOD. Cooking a meal with my husband and kids and enjoying it while sitting around a table with great conversations was what was missing from my life and suddenly it felt so IMPORTANT. I spent a few more miserable days in my lab and finally took a drastic step that left my parents and the rest very disappointed. I QUIT MY JOB. My husband always understood how I felt and was glad to have me home so he can enjoy my home cooked meals and my kids were ecstatic to have me home so they can hang out with mommy in the kitchen and help me in their little ways. Ananya, my older daughter passed on spoons and veggies to me where as my younger daughter Akshara sat on the granite top in the kitchen and was my taster:) She tasted every dish I prepared and always say “yum”. I enjoy my days with family cooking for them every single day and have realized that “Nothing gives me so much happiness and satisfaction in life but COOKING”. I have received so much of encouragement and support from friends that they give me requests for food and we all get together on Wednesday at my place. Wednesdays because it is the middle of the week and they are all excited for the treat that awaits them. We hang out, listen to music, party and of course they enjoy all my dishes. Some of my friends love my food and asked me over to cater their kid’s birthday parties. And then started my new journey where through word of mouth, I started getting party orders from several people. I have catered for Thanksgiving, Christmas, New year, Birthdays and also few Engagement parties, a Small Wedding and few Baby showers. I love and respect food and cooking is my passion and soul now. I enjoy catering food for people who need help and are short of time. It gives me such joy and satisfaction to see the smiles on their faces. Life moves on with currylicious dishes that I cook every single day for friends, family and everyone who needs a hand organizing parties. I have now decided to share my story, my family, my catering experiences, my life which is COOKING and all my recipes with everyone…….Hope you enjoy. I would love to hear from everyone and appreciate all your suggestions/ comments. Thanks much and appreciate your time. I sent you an email with all my information. Looking forward to hearing from you soon. Would you mind removing my comment from your post. What I shared was just for you. Ignore that request! I thought that I had my email address on it! You have a great blog! Nandin,i such a great life story. Love have things have turned out for you. Wish you all the best! Your food looks amazing! Am sure it tastes great too! Nandini, really happy to see how things have turned out for you:) very few people have the courage to follow their heart and im so glad you did. love the look of your dishes. Nandini! The blog looks amazing AND BEN STARR RACED ABOUT YOU?????? Hell to the YEAH miss!!!! Miss you and keep up the amazing work! Also I loved reading your life story. MUAH! 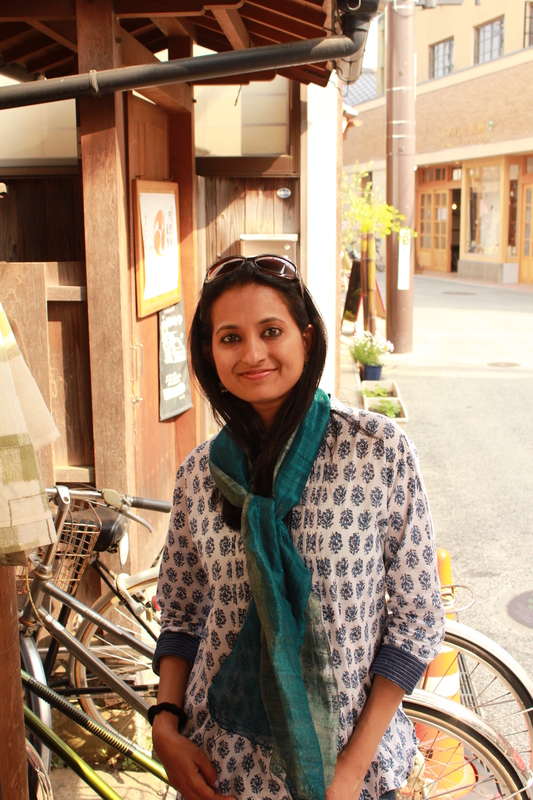 Dear Nandini, I just loved to read your story! During one of my travels to India I stayed in Cochin too and I can say I realy love your country and the vegetarian food a lot! Ever since that time I ate only vegetarian because I love animals to much to eat them. But I am a bad cook, so now I’m going to follow you and hope I can learn a lot from you. Tank you so much and lots of love from Sandra from the Netherands. Best choice Sandra, vegetarianism is the best diet. I read your article in India currents magazine. I shared your story with my older daughter, Anjali, 7, who thinks you are strong and courageous. I came to this country at 11 years of age. Now I am 39, married, also with 2 daughters, also sharing a passion for cooking. I’m a physical therapist by profession and only work 2 days a week also for the same reasons as yours. I prepare fresh vegetarian food for my family daily. I feel joy and satisfaction in this. They look forward to hot rotis with the aroma of ghee. I’m currently doing my yoga teachers training with Siddha Samadhi Yoga so am experimenting with raw, high pranic value foods. I encourage you to do the same. A couple of years ago we took a family trip to Kerala and it was beautiful. It was a dream of mine for very long. We currently live in the Los Angeles area. I also often dream of having a restaurant as I’ve also developed a passion for the kitchen later in life! Great hearing about you. Best wishes. Great, ananthasivan and me were together from Engineering days till for a long time. i have see you of course at a much younger age. Dear Nandini, its really nice to see you do what you love the most.i am so happy for you.My best wishes dear friend. Very interesting! I am an IT professional and am so much fond of cooking and experimenting with cooking. I make it a point to cook something new every evening i return home. Kudos to you for taking that big leap…I wish i can do it too! Am very interested to know if you have any recipe blog as I am also a vegetarian and extremely fond of trying out new dishes! 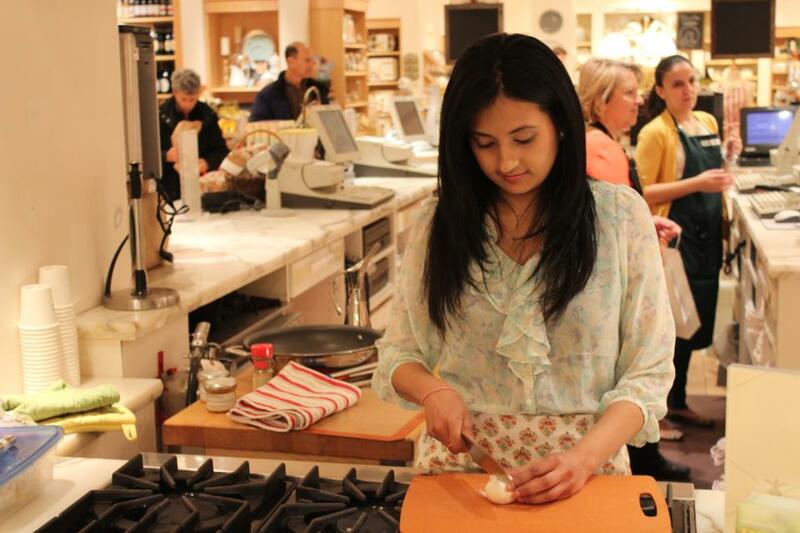 Camille and I attended your fabulous cooking class today at Wholefoods. Your presentation and demeanor were authentic , gracious and delightful. Best of everything ! 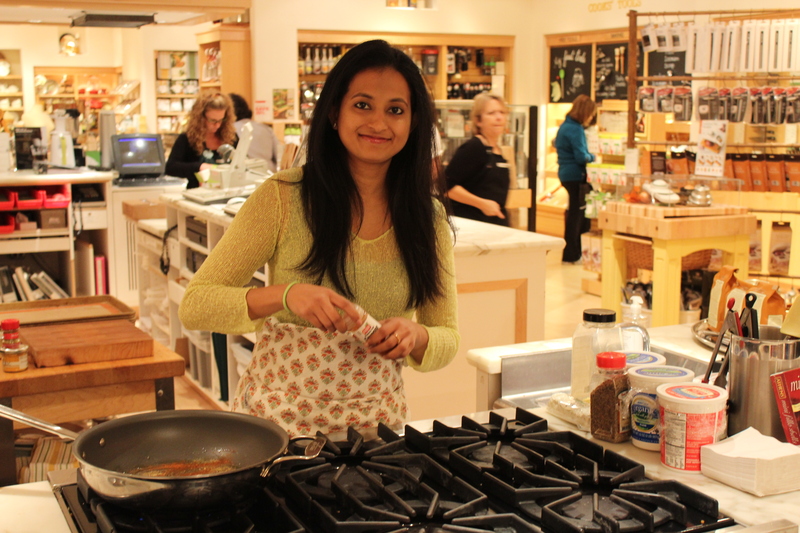 Cooking Demonstration & Tasting with Nandini on Friday Sept 27th at 7:30 – Geralyn’ Art STudio & Gallery , 103 Baker Street, Maplewood NJ 07040. Book in advance call geralyn on 973-275-1966. Spaces limited so book early. I just googled to see if there was anyone who is a veg or a vegan and a chef as my dream is to be a chef too and I found you. I am so happy to read about you. Gives me hope in what I want to do. Well written nandini….god bless… happy to see u chasing ur passion n doing what u love. So happy to read your life Nandhini in which I was also a participant at a period of time. Feel good to read about your big transformation…..
Hi I am a friend and classmate of your mom.I would love to follow up your cooking experiments I myself was a total failure in cooking when I started on after marriage . But now Ido fairly well in staple dishes.but love to explore .so wishing you all the best in your endeavours .